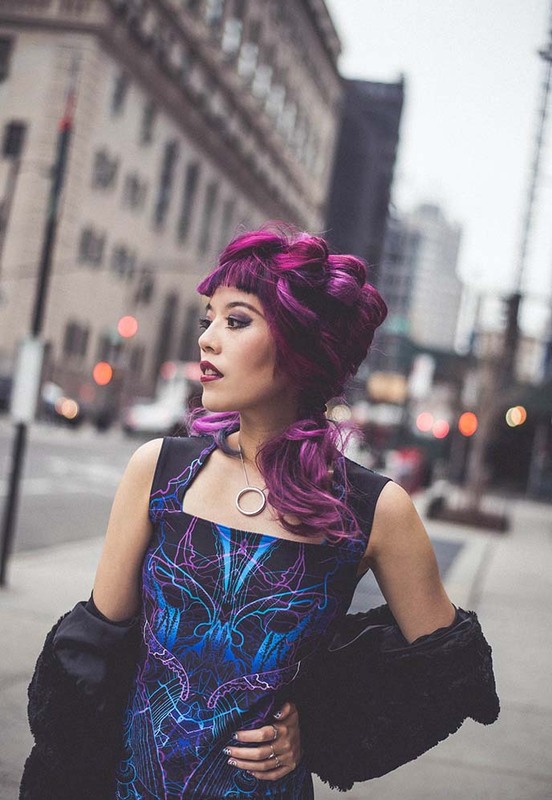 Alien Botany dresses by Zoetica Ebb: cyber futuristic fashion! 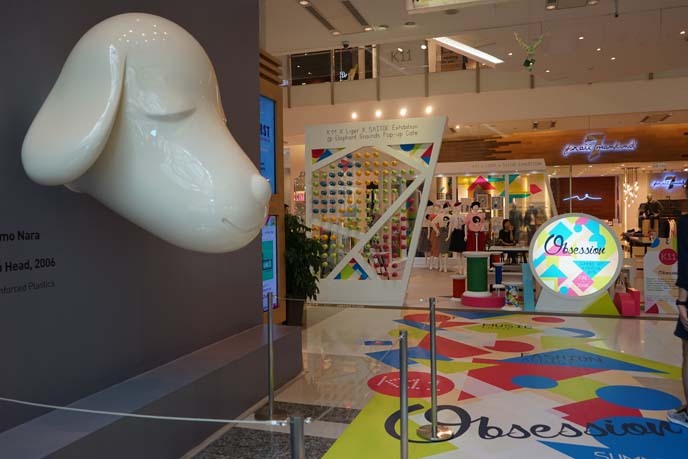 Hong Kong’s The One & K11 art mall. What will we humans wear, in the year 2100? 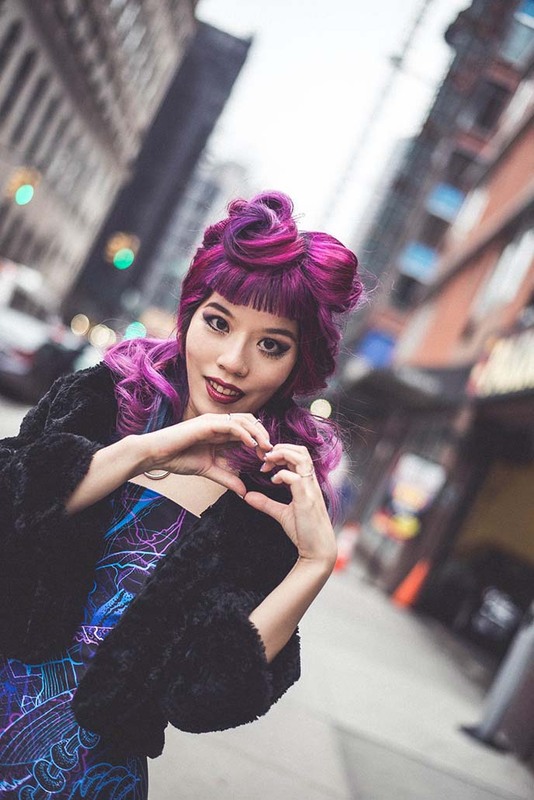 My bet is on this Alien Botany dress, designed by my talented friend Zoetica Ebb! I’m excited to reveal that her futuristic dress collection is back, in a limited quantity run. I’ve been wearing mine like a second skin — this truly is wearable art, designed with the body in mind. Artist Zoetica Ebb and I have known each other for years, and I’ve long admired her multimedia work. 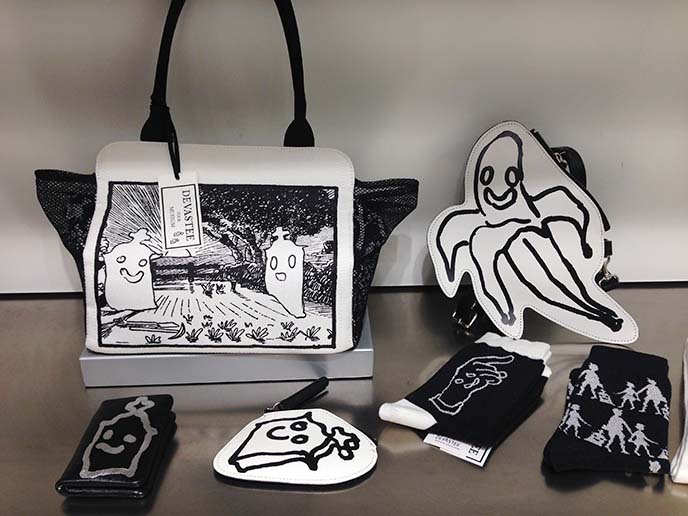 Her Alien Botany collection reflects her fascination with the cosmos and alternate history. Tentacles and alien flora slink over the fabric, creating a form-flattering effect. The Alien Botany dresses are made with a breathable heavy spandex. Zoetica’s hyper-detailed drawings are custom printed in ornate, dazzling detail. A square collar and dip hem add to the elegance of the design. I love the versatility of the garment: I’ve worn it at a crazy underground party, a family wedding, and a gathering with friends. Bonus for travelers: the fabric doesn’t crease, so it’s easy to pack in a suitcase. I’m always looking for unique fashion that reflects my love of the future, technology and subcultures. Alien Botany’s “neon space punk” is unlike anything I’ve seen in stores. 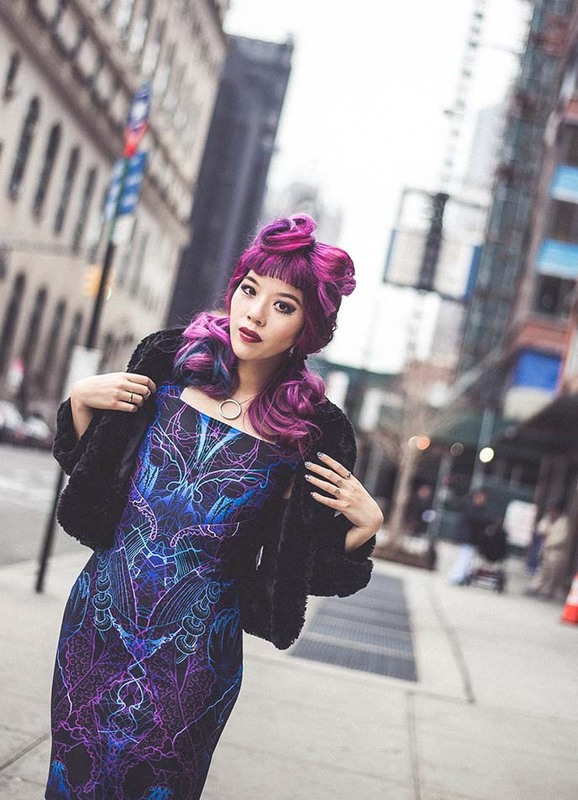 (Joey Wong shot these photos of me in Brooklyn, NY. My hair is colored and styled by Stephanie Hoy of Vancouver, Canada). With my purple hair, this dress seems to be made for me. Here’s a close-up of the stand-out detailing and colors. 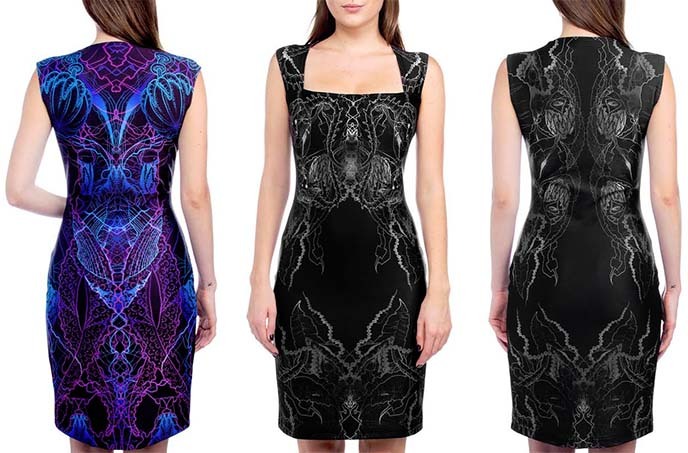 Happy news: these Alien Botany dresses have re-launched today, in two styles! You can find out more on Zoetica Ebb’s web shop. I have the Venenum (left), and it also comes in the Theca (monochrome). On May 3rd, you’ll be able to see Zoetica’s editorial for the Spring 2016 issue of Auxiliary Magazine. 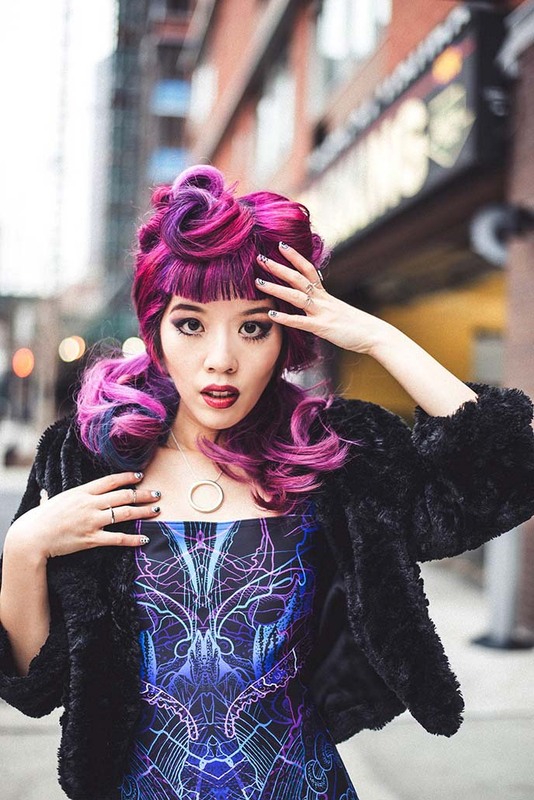 She styled and art-directed a showcase of her Alien Botany dresses, for this alternative fashion magazine. The Alien Botany dresses are available internationally at www.zoeticaebb.com, along with Zoetica’s original prints and art. Let me know what you think of my friend’s designs, and it would be fantastic if you can share this post to support her! 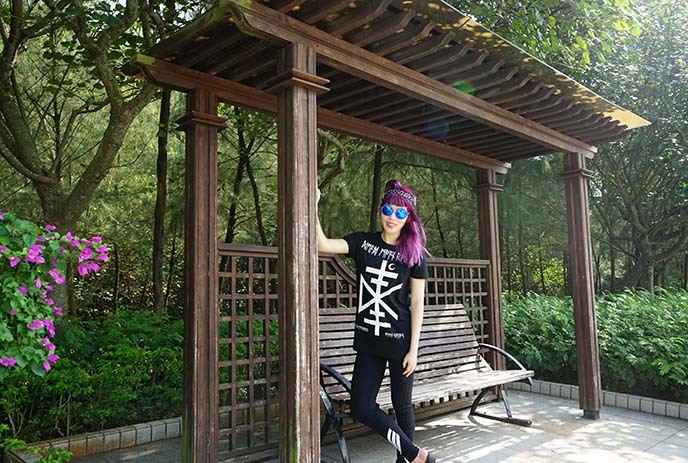 Since this post has to do with the future… it makes sense to continue our adventures in Hong Kong. I still have photos to share with you, from my last trip to this tech-happy, pop culture city. 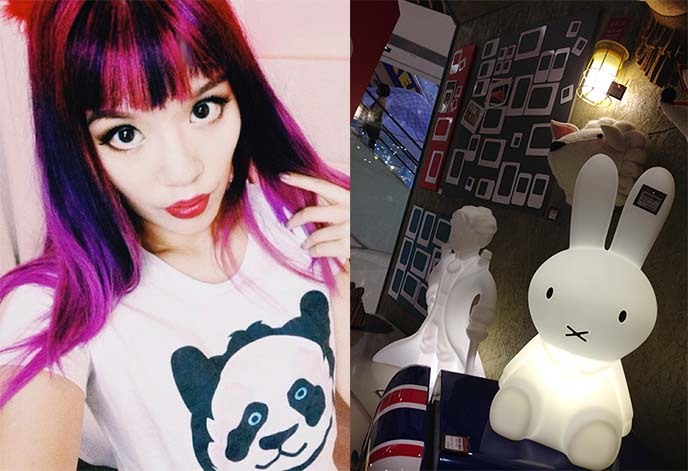 Hong Kong’s malls always have life-size displays for people to pose with. 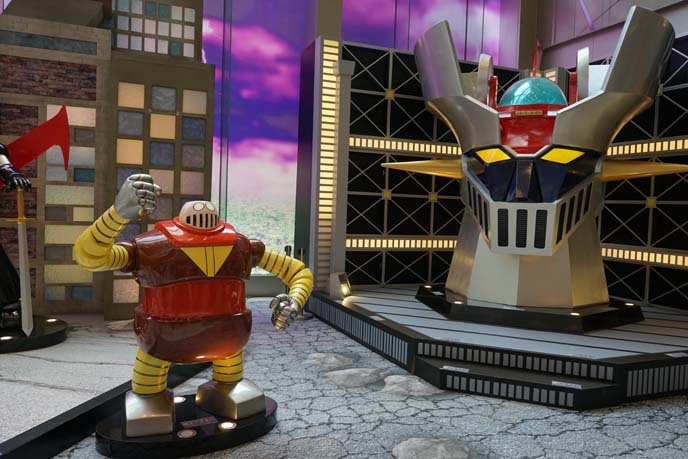 I came across these fighter robots and a special merchandise pop-up. Outside iSquare mall, I found circus statues starring B. 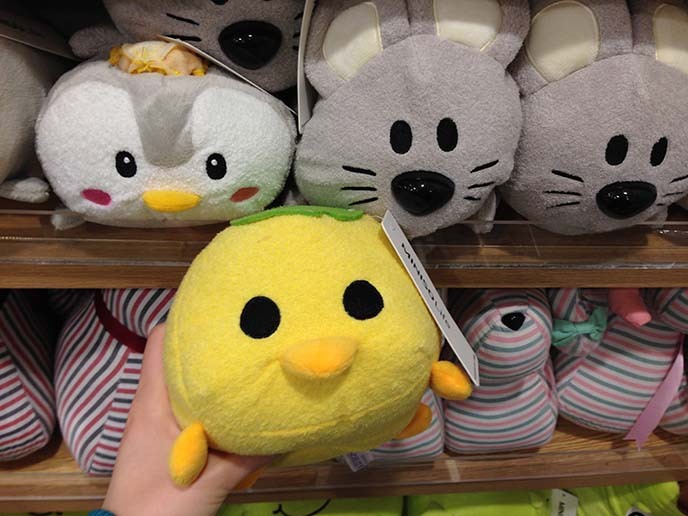 Duck, the rubber ducky. I’ve photographed most of Hong Kong’s streetwear malls for you, but never got the chance to showcase The One in Tsim Sha Tsui until now. Causeway Bay remains my favorite shopping district, but TST is a close second. It has several malls dedicated to Chinese streetstyle, all within walking distance of the subway. I walked in, and immediately saw rocker fashion featuring Hello Kitty! I’d wear that leather jacket and clothes with all-over graphics. Malls like The One are in my “sweet spot” for price and quality. 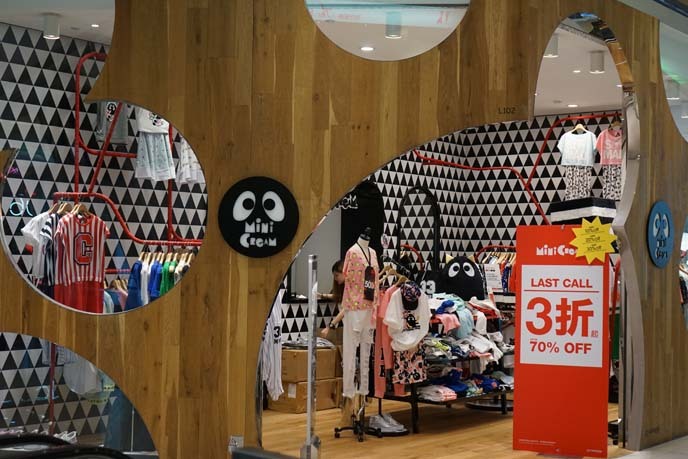 The designs are unique (found only in Asia) and well made, but not overly expensive. Here’s my old favorite, Hyoma x Mini Cream. The sale prices are truly insane in Hong Kong. For example, I paid $26 US for a pair of metallic shoes from this brand — originally, they were over $200. The label’s black devil cat with round googly-eyes is irresistible. 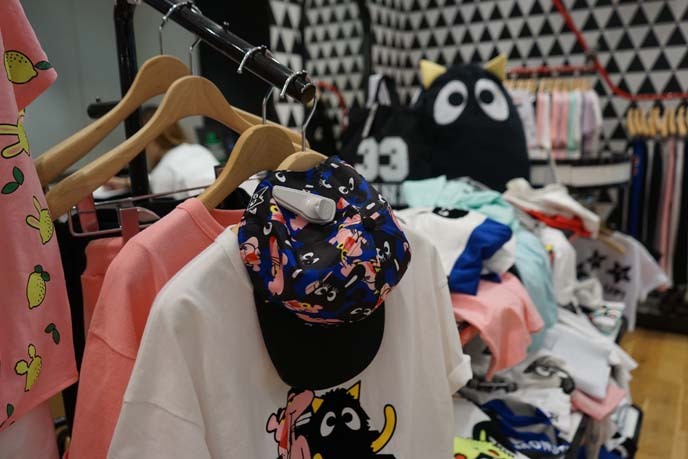 Other boutiques in The One had collaborations with characters popular in the 1980s and 90s. 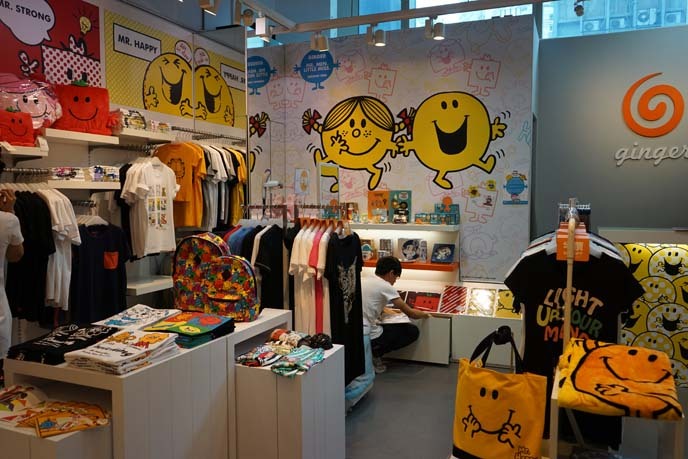 The streetwear shop Ginger teamed up with Mr Happy and friends. 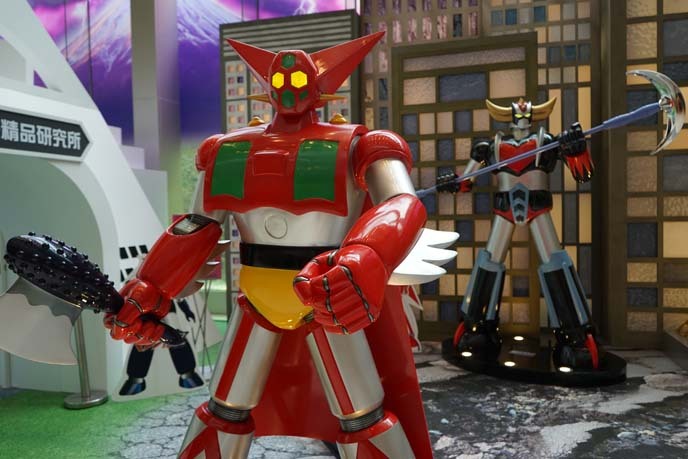 This mall seems to be dedicated to mascots. 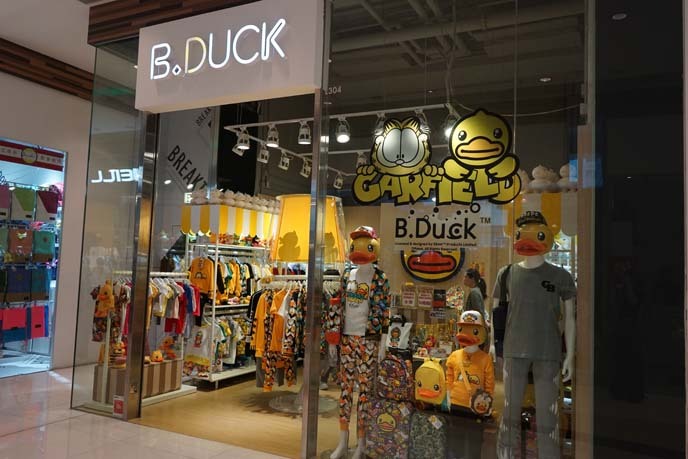 Garfield and Rubber Ducky are the faces of the label B. Duck. The One is also home to the Gudetama theme restaurant, which serves dim sum that looks like the Sanrio egg character. And then, there’s the one who rules them all: Miffy the bunny! The purse with her crying face and plush dangling ears… yes. 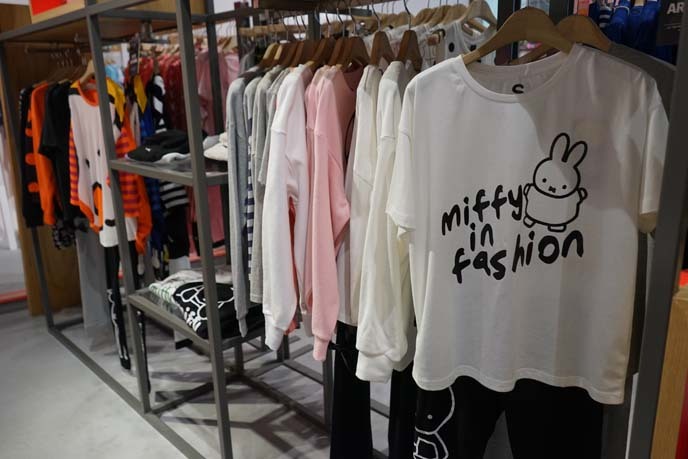 I got a black and white graphic sweater at the Miffy x Two Percent store. She remains my favorite cute character. 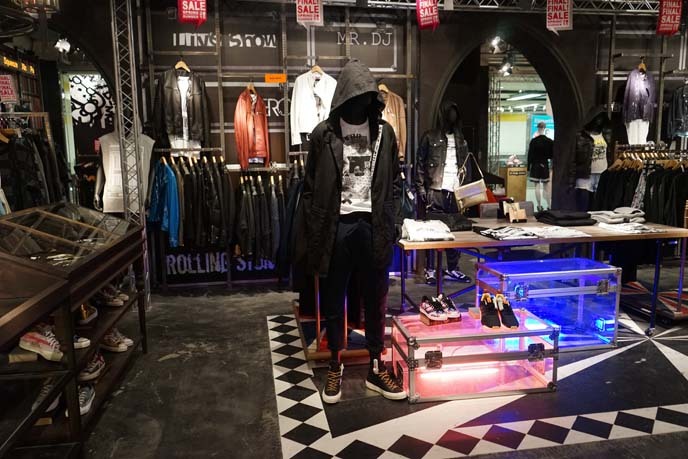 Hong Kong’s TST district is home to another favorite shopping plaza: K11 Art Mall. As the name suggests, the boutiques all have an artistic bent. Visiting Cheung Chau Island by ferry! Hong Kong cute character stores, FoFo Spanish restaurant, Bindaas Indian. Believe it or not… the above photo was taken in Hong Kong! The city is known for its tall skyscrapers and hectic atmosphere. However, you can escape into nature — simply by taking the ferry to several nearby islands, including Cheung Chau and Lamma Island. 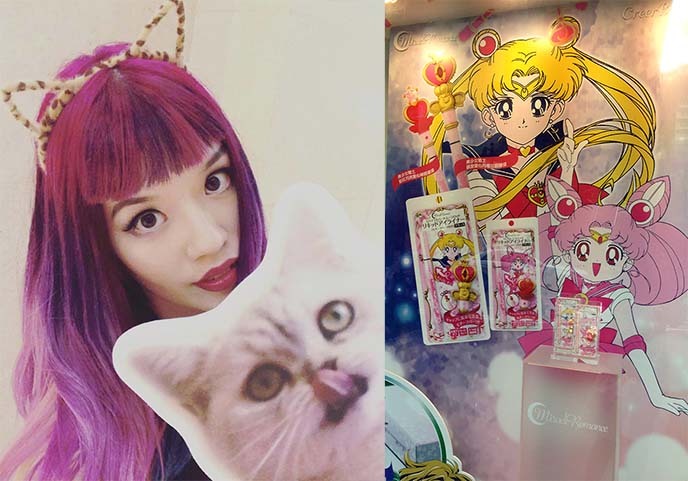 I’ll also show you some of the newest restaurants and kawaii pop culture in Hong Kong, such as this Sailor Moon makeup collection at SaSa. 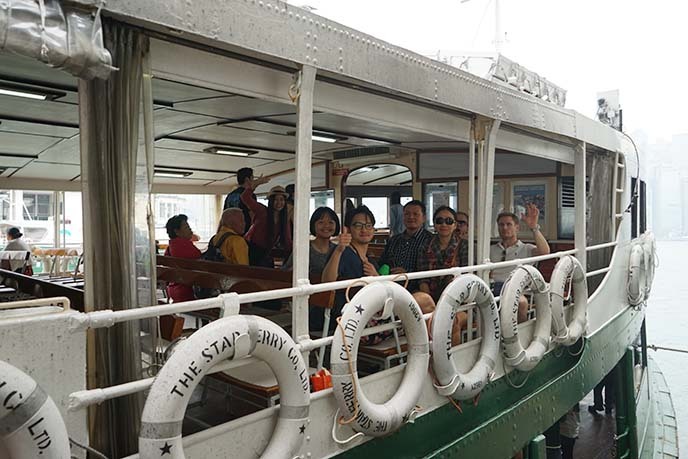 One of Hong Kong’s icons is the Star Ferry, this open-air boat that runs from Tsim Sha Tsui (on the Kowloon side) to Central Pier. From there, you can hop onto ferries that take you to the outer-lying islands. The most popular islands are the beach-y Discovery Bay, and Cheung Chau (home to the annual bun festival, where brave or foolhardy participants climb up a giant tower made of Chinese buns). It takes about 40-60 minutes for the ferry to reach these islands. 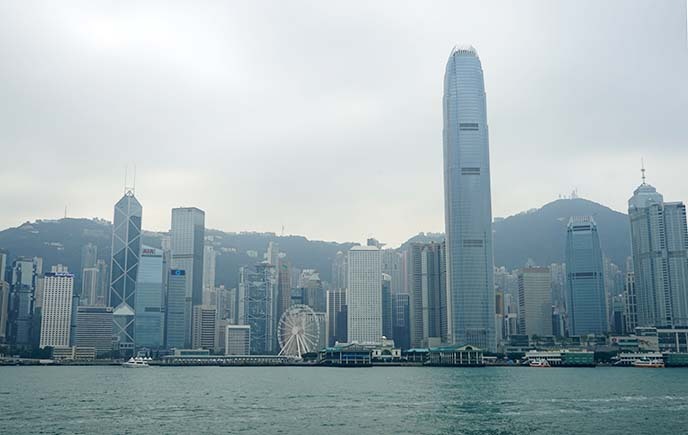 As you sail, you’ll get to take in spectacular views of Hong Kong’ skyscrapers. However, be prepared for choppy waters that can rock you off your feet. I recommend visiting the lesser-known Lamma Island, which has a relaxed hippie vibe. 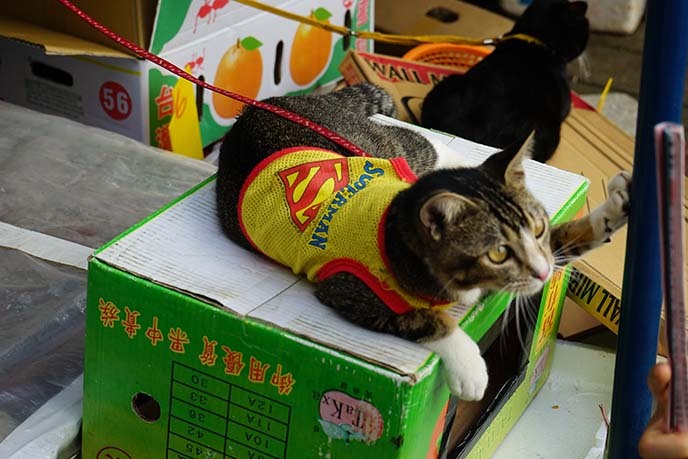 Lamma is home to a cat museum (or Mewseum), small seafood restaurants, and plenty of secluded natural spots for swimming and hiking. I also went to the larger Cheung Chau island for the first time. 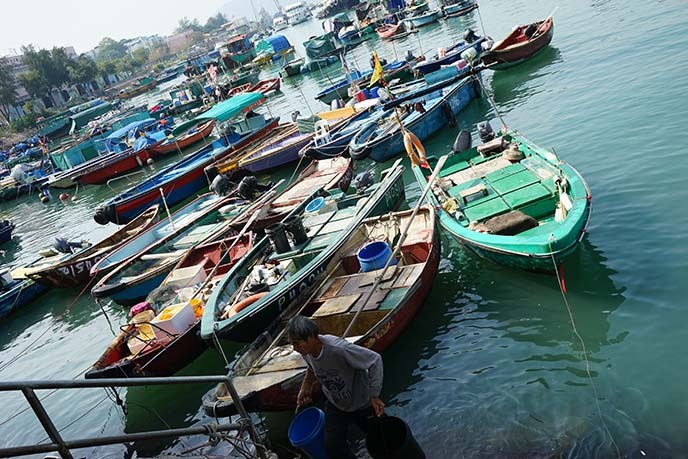 This is a popular day-trip destination for both locals and tourists, as it lets them escape the “Hong Kong hustle” for a fishing village atmosphere. When you step onto the boardwalk, you’ll see rows of little shops selling island specialties: dried squid, fish balls on a stick, and the famous stamped buns. 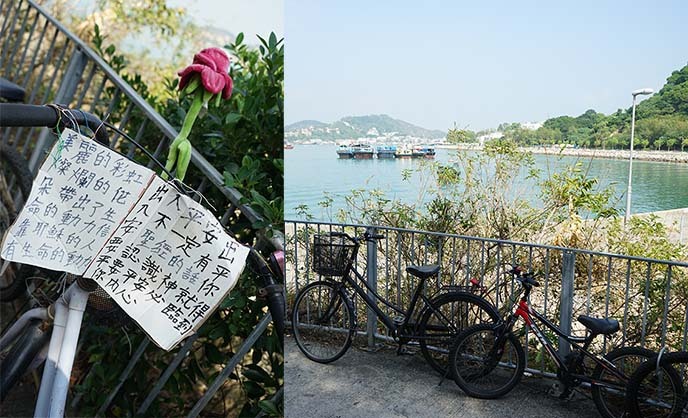 It’s possible to walk around Cheung Chau — but the winding paths around the island are made for cycling. There are plenty of stores that rent out bicycles and canopy-covered tricycles. It’s a must do. I had so much fun zipping around and taking in the ocean views. With a bike, it’s easy to stop by landmarks such as the Cheung Po Tsai pirate cave. I enjoyed my island getaways, as a way to slow down and relax in nature. 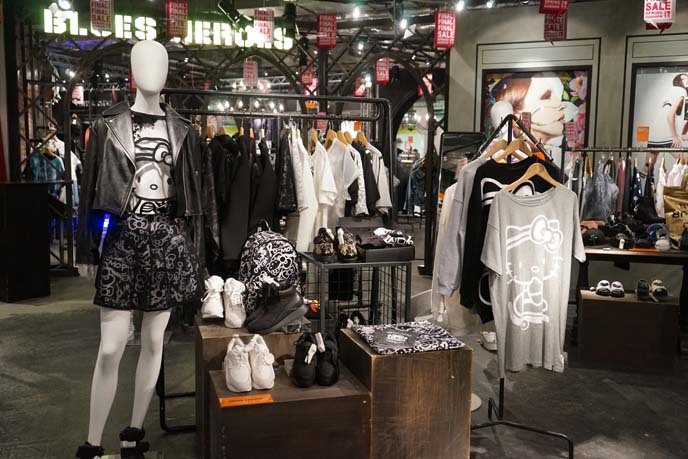 However, there’s no place like Hong Kong to get your cute shopping on! It’s the best concept ever. 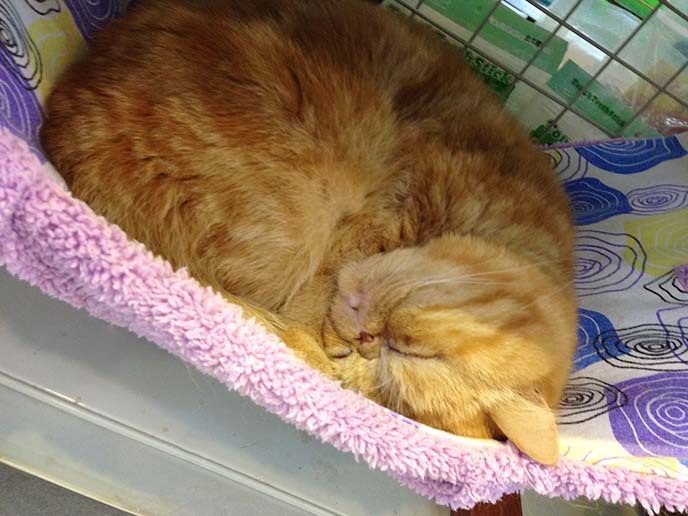 All of the cats inside this store… have flat faces! 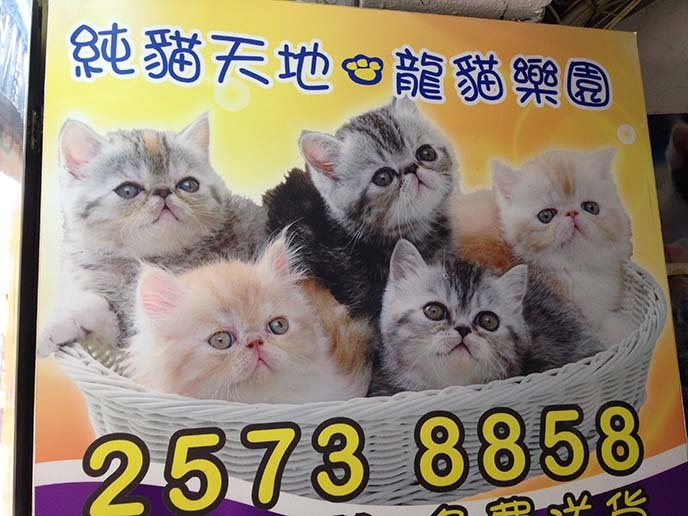 There’s always a Scottish Fold and Exotic Shorthair in there. 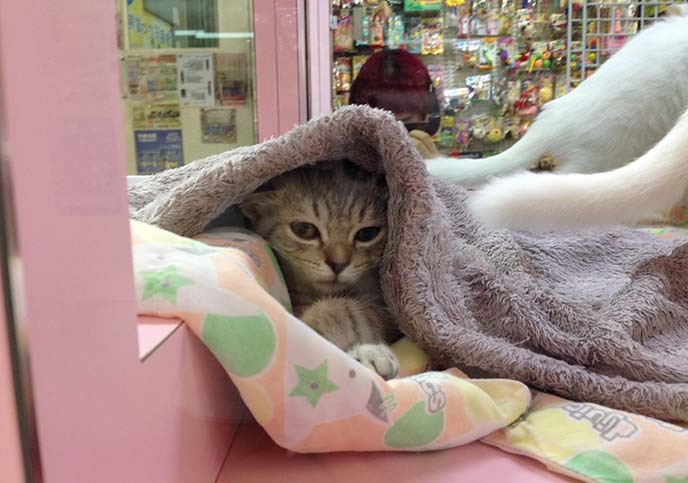 You can say hi to them, and pick up cat toys or food. 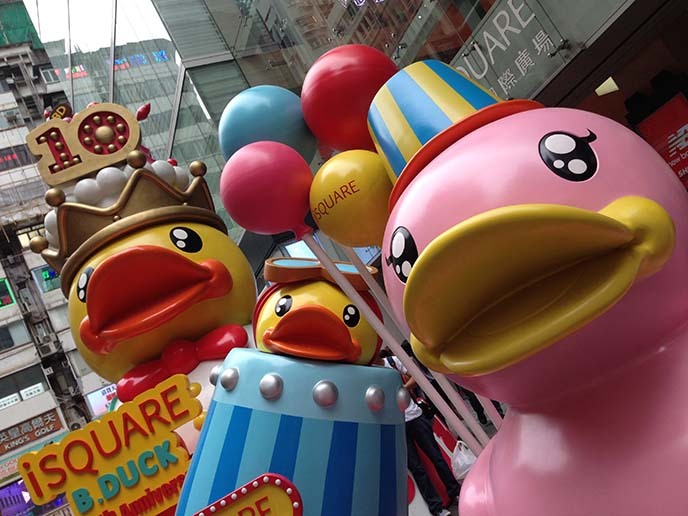 As you’ll recall from my Causeway Bay travel guide, this area is known for its Japanese malls. 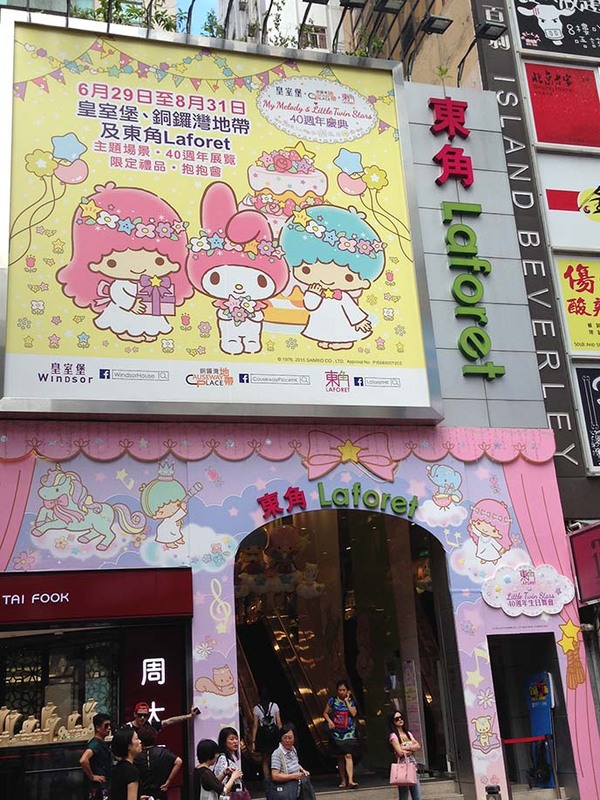 Laforet always has changing themed displays. 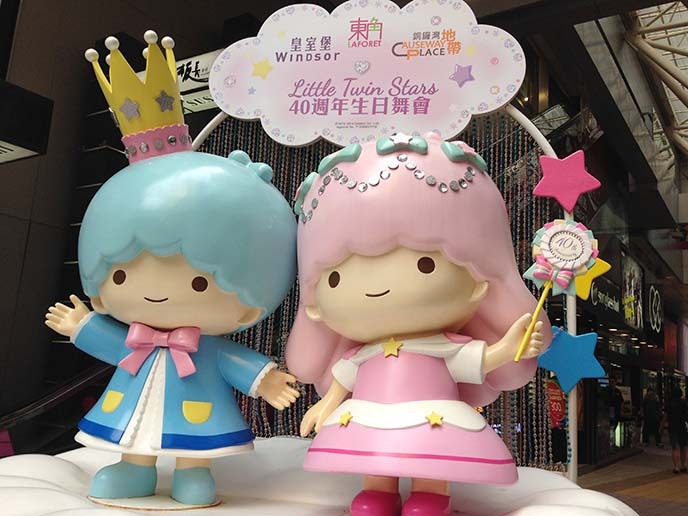 When I went, it was covered with pictures of Sanrio’s Little Twin Stars. The pastel shades of the 1980s are back in style. Kiki and Lala haven’t aged a day. 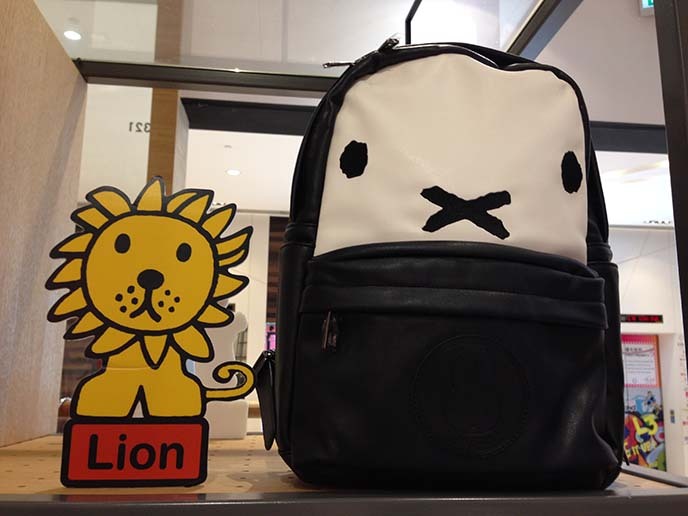 In Hong Kong, Sanrio characters are everywhere — and they’re not only for kids. You’ll find high quality purses, wallets, shoes and clothes with subtle designs featuring the characaters. 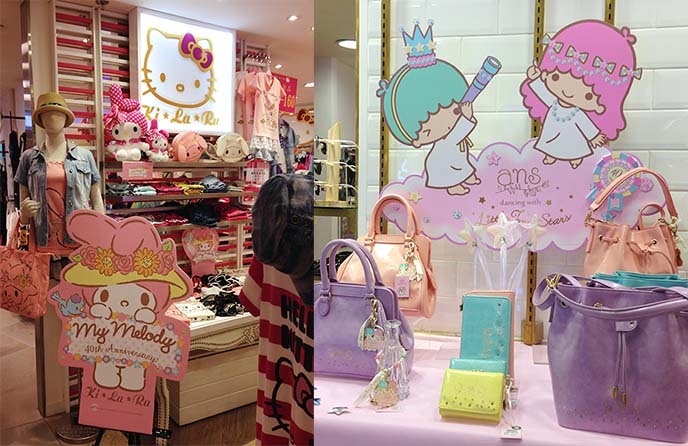 ANS and KiLaRa are two Asian brands that often collaborate with Sanrio. 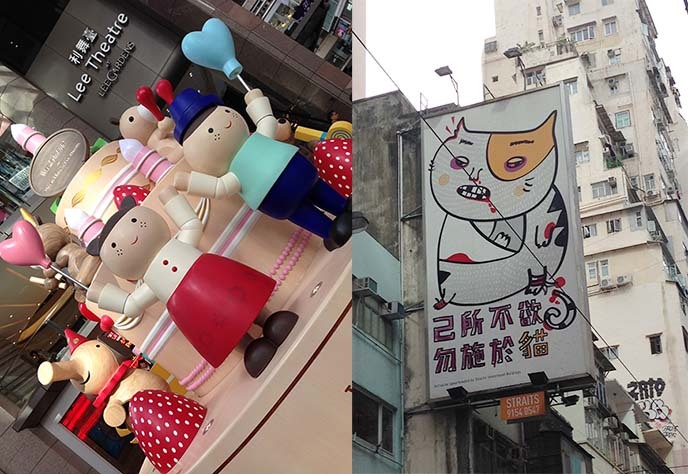 Kawaii is sometimes a bit twisted, in Hong Kong. Everywhere you go, there are cute-meets-weird signs and public displays. 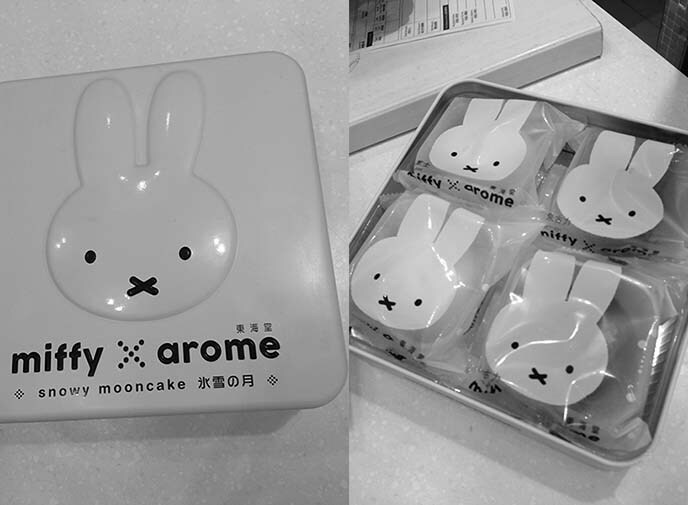 You know I’m addicted to Miffy the bunny… Arome Bakery has dozens of location around the city, and this season, they carried Miffy moon cakes that came in tin boxes. 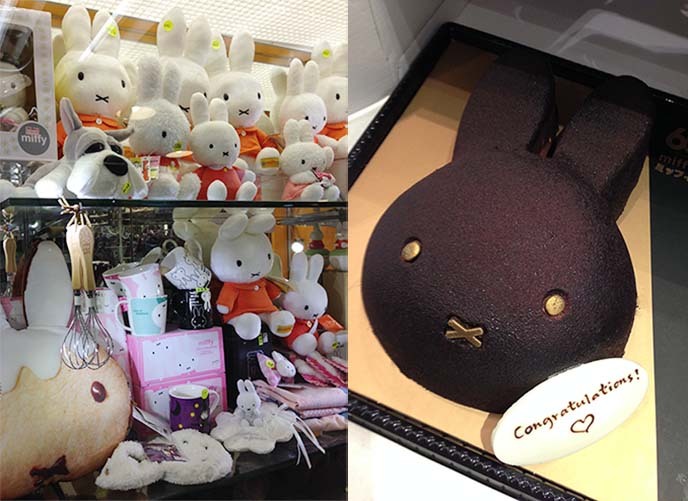 Arome has a new dark chocolate truffle Miffy cake with gold eyes and an X mouth. It’s scrumptious: layers of moist pudding and cake, spongy and not too sugary. 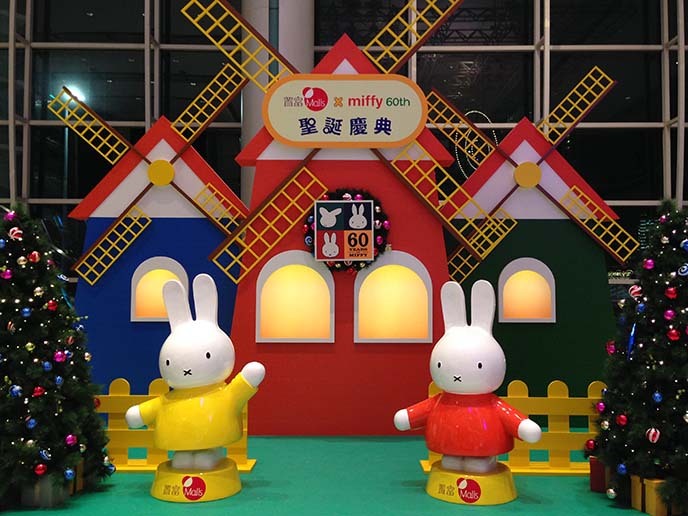 Isn’t it funny how Miffy, a character from the Netherlands, has taken over Hong Kong? 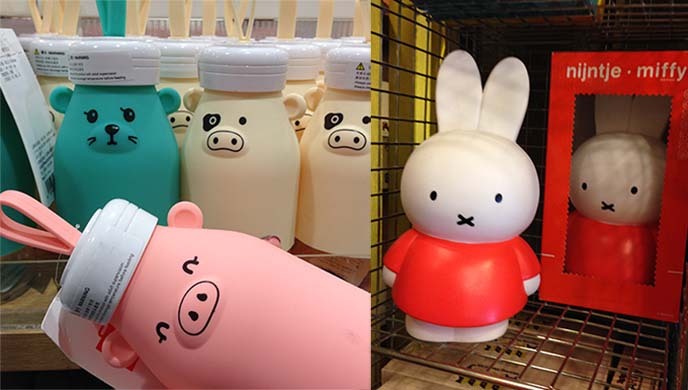 In Japan and Korea, you won’t find nearly as many Miffy toys and products — and there are no such cakes. One of my favorite stores is Homeless, the interior design shop with locations in Central and Sha Tin. 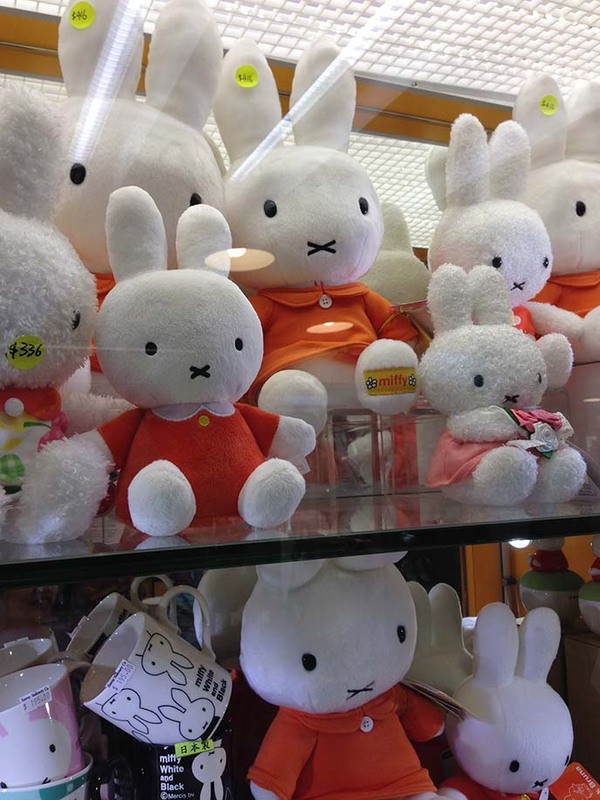 They sell lots of Miffy goods — I picked up “Nijntje” keychains (that is her Dutch name). In the Hung Hom mall next to Harbour Plaza Metropolis hotel, I stumbled upon a holiday display. 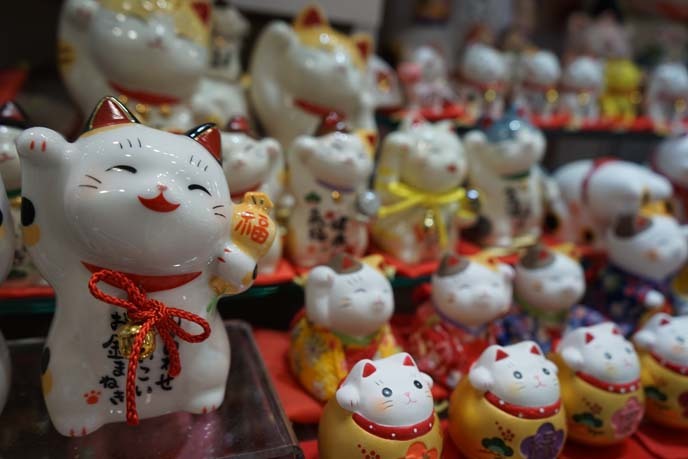 Japanese kawaii designs are found in every part of Hong Kong — and usually for much lower prices. I couldn’t resist getting the fat mouse from the MiniSo store. Each toy is about $4 US. 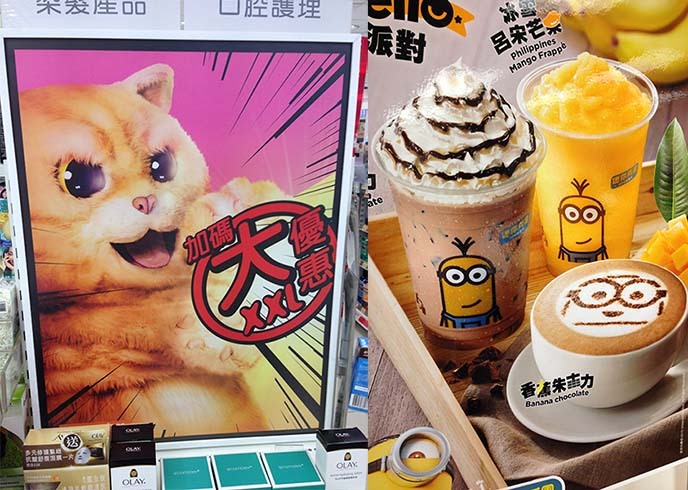 Minions is currently the rage in Hong Kong, and I saw their smiling faces on lattes. Cats remain popular as ever. 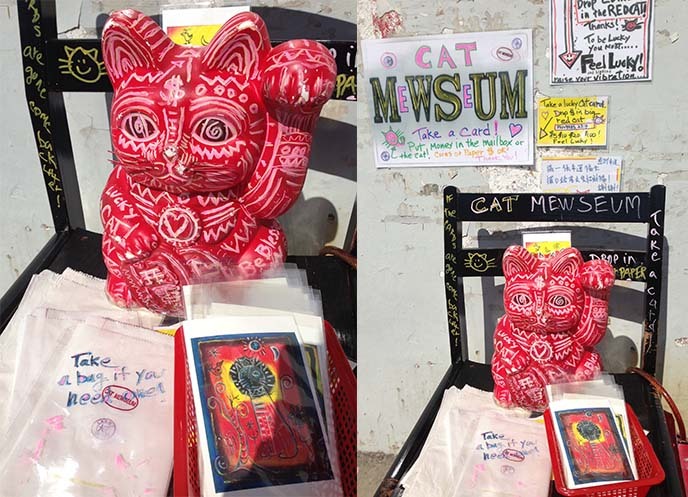 You can find maneki nekos (fortune cats) everywhere for sale. 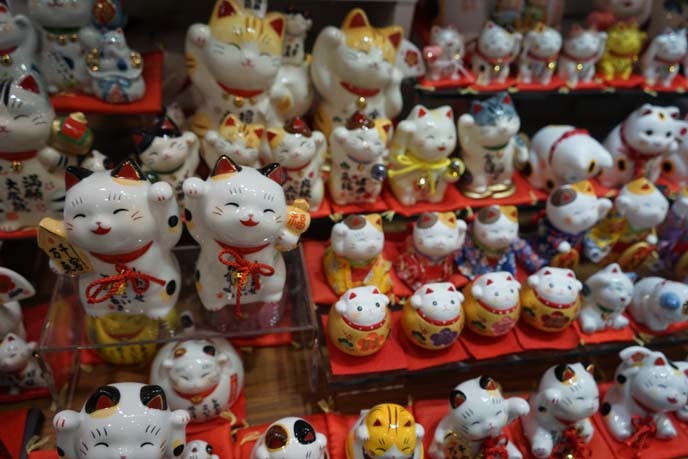 These ones have both paws raised, for extra luck! Another reason to love Hong Kong: the international dining. 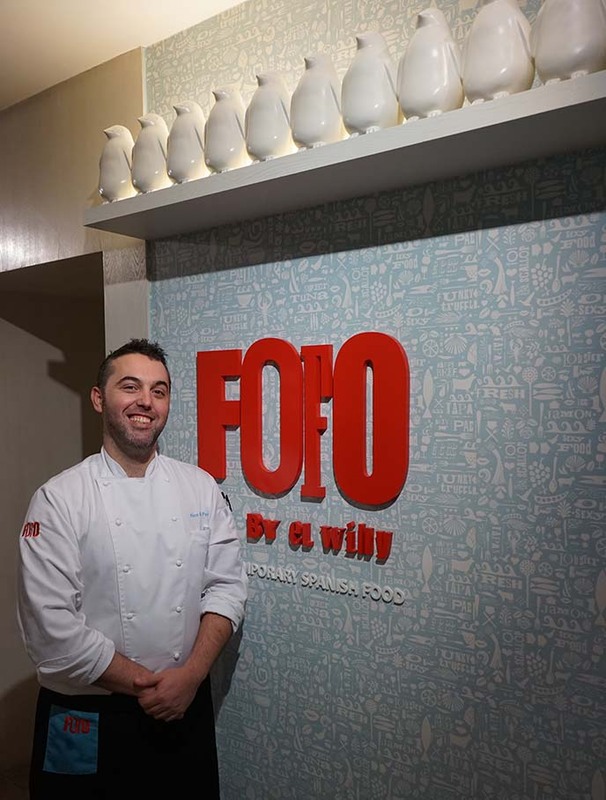 I had a magnificent dinner at the award-winning Spanish restaurant, FoFo by el Willy (address: 2-8 Wellington St). The smiling chef, Alex Fargas, skillfully designed the menu with influences from his native Barcelona and travels abroad. I felt at home in the minimal space, decorated with rows of white penguins on the shelves and chandeliers. The server introduced me to a cute, round bull statue and explained that he is the mascot — since the word “fofo” means plump! 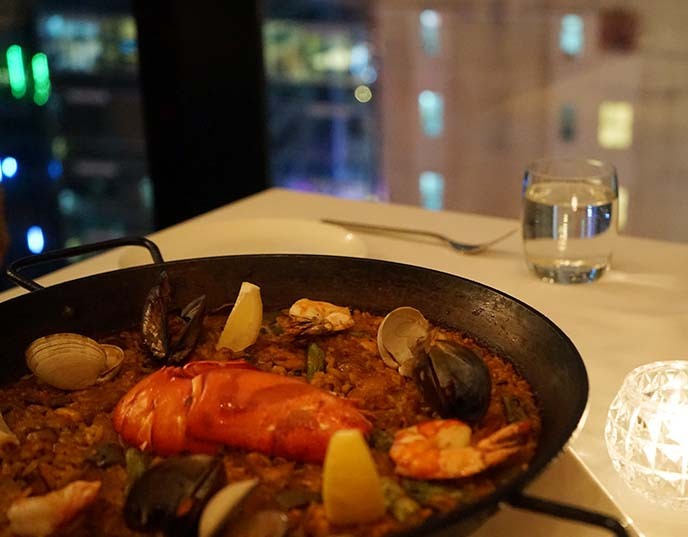 The chef is a master at traditional Spanish dishes, which he delivers with a contemporary execution. We ate up every bite of the “bikini” sandwiches made with the finest cheese and Iberian ham, and juicy paella with seafood (above). 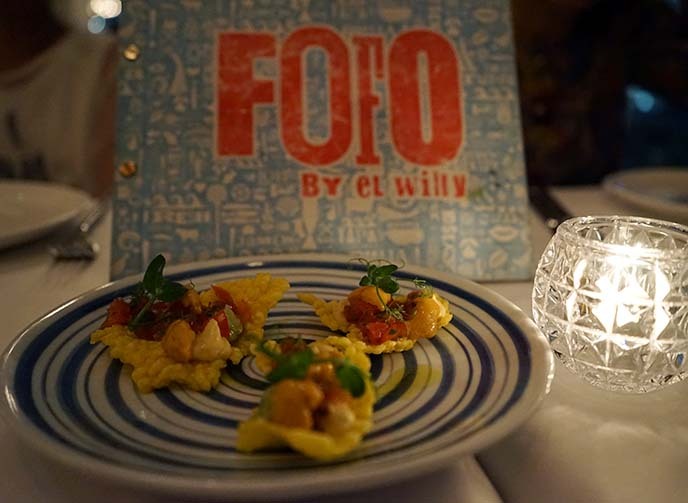 El Willy gets especially inventive with its tapas, or bite-sized shareable plates. I popped a “Salmon Explosive Air Bag” in my mouth, and the pastry burst into a delight of truffle sour cream and smoked salmon. Also home runs: paella crackers with sea urchin, and scallop ceviche with avocado and crispy shallots. 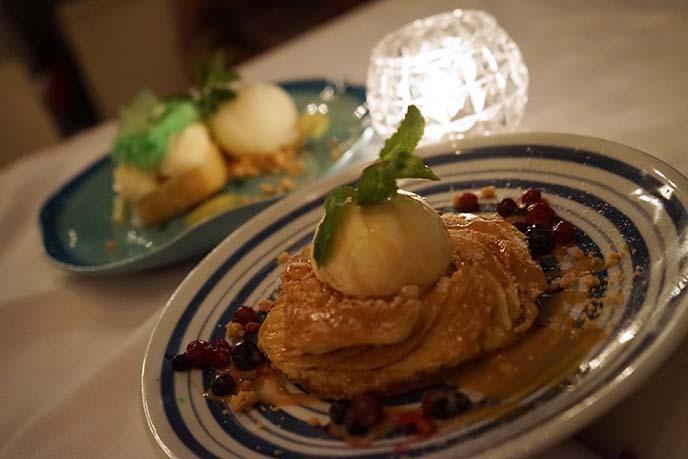 The desserts hit the spot with a freshly baked apple tart, churros with dark chocolate dipping sauce, and a creative “mojito” made with mint, jelly and sorbet. 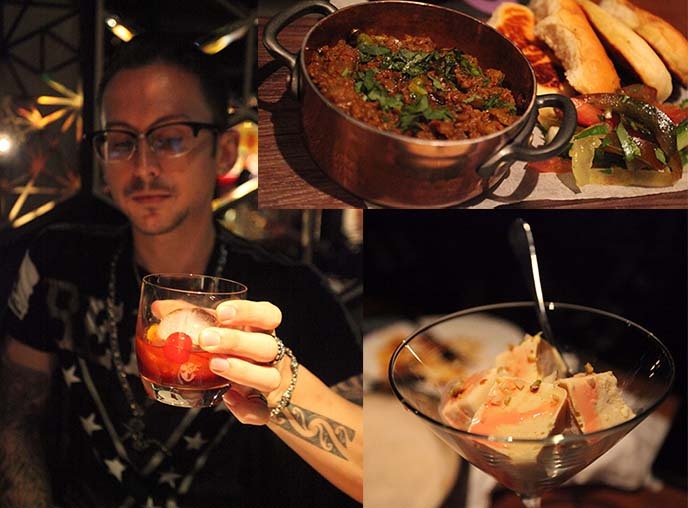 With a laid back atmosphere and exceptional cuisine, FoFo is now on my short-list of favorite restaurants in Hong Kong. My friends and I also went to the newly-opened Bindaas Bar + Kitchen, an Indian restaurant near the PMQ art center. (Address: LG/F, 33 Aberdeen Street, Central, HK). The chefs recently came here from India, and brought their expertise to each dish. Nothing is heavy-handed: the ingredients are fresh, and the spices are a delight to the palate. At the same time, Bindaas is not afraid to get creative, and excels at fusion. 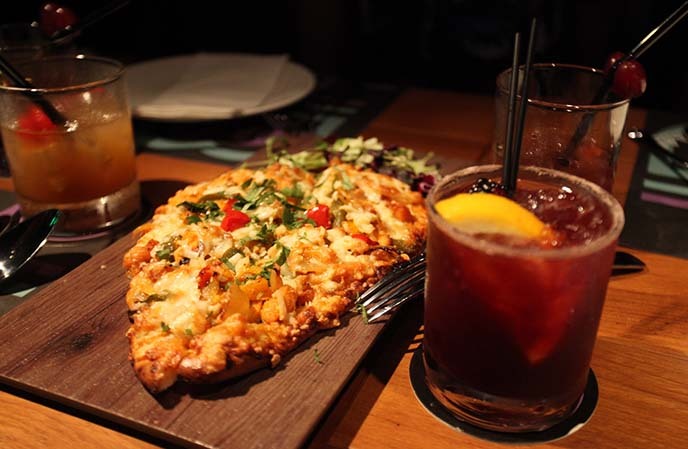 Their naan pizza is a must eat: it comes with several varieties of toppings, and brilliantly merges two comfort foods into one. 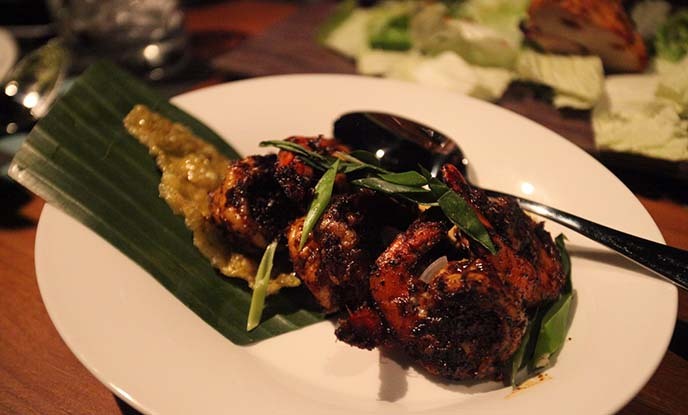 The seafood curries and tandoori dishes are stand-outs, and the small plates are great for sharing with a group of friends. Bindaas is brilliant at Indian fusion, and is a welcome entry to the Hong Kong food scene.